If you are a Royal Bank of Scotland business customer or Natwest you will of been contacted to give you the eligibility to consider bank switching. There will be an opportunity for you as a business customer to look at a range of exclusive offers to switch your business current account to a selection of participating banks. Business Banking Switch is only available to certain business and commercial customers, with a turnover of £25 million or less at an individual company level, who was due to move to Williams & Glyn. You’ll know if you’re able to take part as the Royal Bank of Scotland will have contacted you about it already. If you have received a communication you may be wondering why you are being asked to switch to another bank – the reasons are – in 2008 and 2009 the RBS received financial support from the UK Government, as a result, they made a commitment to help increase competition in UK business banking and reduce market share. The RBS had originally planned to do this by setting up a new bank Williams & Glyn which you will have been due to move to if you banked with RBS but this is no longer going ahead. The Business Banking Switch proposal has now been approved by the European Commission and you will now be able to switch. 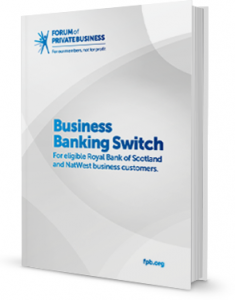 We have teamed up with RBS and put together a business banking switching guide to help with your decision, and RBS are also offering customers a better switching deal that is better than those normally available on the market.